Enjoy it while it lasts. This American Lotus (aka “water lily”) will drop its petals and assume its more pedestrian and less attractive role as a seed pod in just a day or two. From there, it’s all down hill. Life expectancy, as ordained for the lotus, from this point is short. The process has already started as evidenced by the brown freckles of a few of the petals. Yesterday, the complexion was probably pristine. As I considered the pitifully short active life cycle of the American Lotus, (erroneously aka water-lily), my recall mechanism took me back to 1971. It was then that the late Jerry Reed, a talented and energetic musician and actor, came forth with a country classic, When you’re hot, you’re hot. 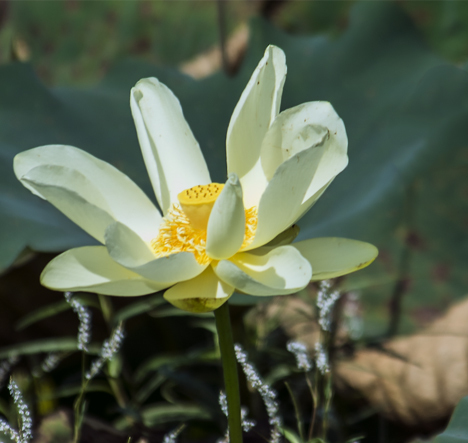 At one point in the song, as he rolls out his story of success and a quick plummet therefrom, Jerry bemoans hearing a judge say “Ninety-days, Jerry-boy, when you’re hot, you’re hot.” Few terms could better describe the life and times of the American Lotus. In these parts, the Lotus begins to seriously stir around the first of June when buds first appear. A few days later, the lotus engine is running at full-throttle. Huge, absolutely spectacular blossoms spring forth from the buds. Once that happens, think belt-fed buds and blooms. The colony is hey-look-me-over, bloom-city on steroids. Enjoy it while you can. It won’t last long. Ninety days later, the colony looks like a lotus slum. However, you can enjoy a really up-close and personal shot of a peaked-out lotus and its attendant bug, plus a couple of additional lotus pictures on the Photo of the Week page at Corndancer dot-com. We’ll wait here while you look. It’s worth the trip. Meanwhile back at the pond, precious few weeks after the lotus onslaught, the plant goes about its serious intent of surviving to make a repeat performance the next year. So far, so good. Ancient Egyptians revered the lotus seed as a sacred object and included them in the booty with which they populated their most highfalutin tombs. Horticulturists say they have planted and raised plants from these seeds. Needless to say, the lotus family has perfected the art of survival. 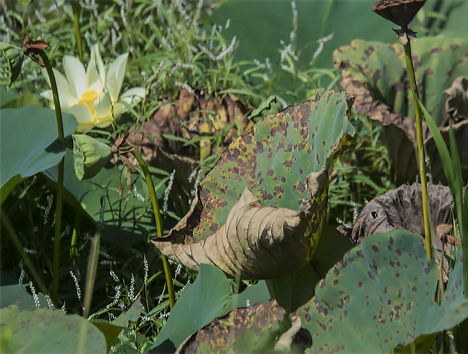 Here’s how the neighborhood looks after Mother Nature’s survival instinct overwhelms the lotus beauty contest. What were once blooms are now seed pods. The blooms you see aren’t far behind. When the lotus nursery mode kicks in, petals drop and the once spectacular bloom becomes a gnarled and pimpled seed pod. It gets worse. The seed pod opens and it appears like a dastardly space monster with a dozen or so beady eyes staring ray-gun holes in your soul — in preparation of having you for dessert — after it just ate Kansas City. Not to fear, they are just seeds in a lowly pod. And they are edible, as are the roots. This is not a space monster and it is OK for children and the elderly to view. 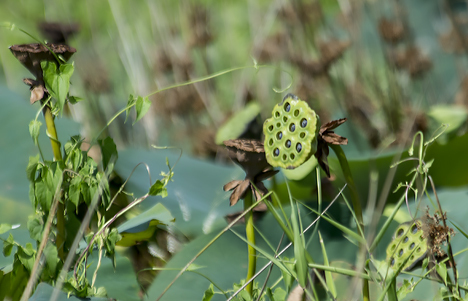 It is a humble lotus pod showing you it’s edible seeds. Yes, I have not sampled the lotus largesse. The green pods will soon become like the brown ones. 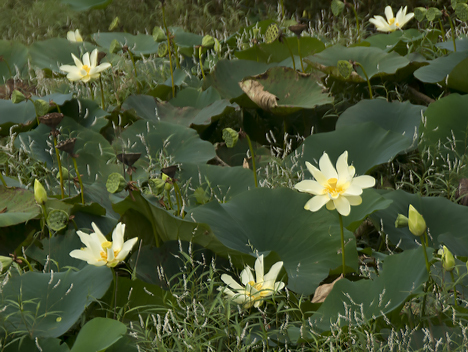 As the neighborhood goes downhill, the once impressive “lily-pad” lotus leaves, having done their duty to nourish the new generation commit hara-kari in favor of the new generation. The leaf to the right has completed its grisly task. The one in the center is a work-in-progress. Whodathunk that a plant could give us a lesson in humility. We rise, we fall, we come back. Thank you, nelumbo lutea. PS: These images are from my favorite lotus colony in a pond at south of the junction of South Hazel Street and I-530 in my headquarters city, Pine Bluff, Arkansas.